I saw a cute thing on Pinterest for gingerbread play dough, but the link didn't have a recipe. We decided to mix up a few batches for the neighbor kids and friends and I kind of made it from a basic play dough recipe. 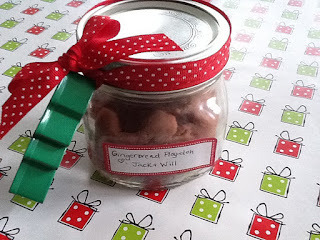 They look cute in little canning jars with some ribbon and a cookie cutter. A fun gift or just a nice activity to do with your toddler! Mix dry ingredients in a medium saucepan. Mix in liquid ingredients and stir until smooth. Place pan on medium heat, stirring often until the mixture begins to form a ball (keep scraping the bottom portion of the pan as it begins to thicken). Turn the ball out onto the counter and knead it a few times. Allow it to cool completely on the counter before sealing it in a container so it does not get moldy. Store in an airtight container or ziploc. FYI, Santa - I've now resorted to taking photos with my iPad! I so enjoy your blog and wonder how you manage to get so much done. Just added this to my Pinterest wall and FB. I think a lot of parents will like this idea!